View important information like weather radar, NEXRAD storm cell tracking, tropical storm tracks and localized forecasts with Raymarine’s SR200! Subscription required, the SR200 includes the SRA50 antenna and can also provide SiruisXM satellite radio to your compatible Raymarine MFD. View Weather, Storm Tracking and over 150 SiruisXM Channels with SR200! 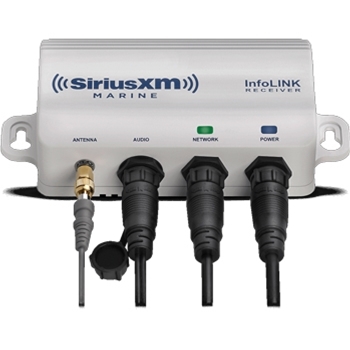 The Raymarine SR200 Sirius XM InfoLink Receiver provides access to more than 150 Sirius XM Radio Channels that include commercial free music, entertainment, comedy, sports, politics and more. The SR200 is a compact, easy to install module that seamlessly delivers data to all of your MFD’s. You can simply connect the Analog line output connection to the Auxiliary input on most every SIRIUS compatible stereo. You would need to make sure that your Raymarine MFD is on Lighthouse 3 Software version or higher and you will be able to access your customized settings on Raymarine’s Lighthouse 3 Sirius XM App. Included is the low profile Shakespeare SRA-50 SiriusXM Marine antenna kit. This antenna can be surface mounted on any horizontal surface with a clear view of the sky, or pole mounted with the included threaded adapter. By Adding the Raymarine SR200 to your Raymarine MFD, you’ll gain not only audio but it provides weather and fishing information as well. You’re going to receive essential information like weather radar, NEXRAD storm cell tracking, and localized forecasts. All of these features would be viewable from Raymarine LightHouse 3 Charts. 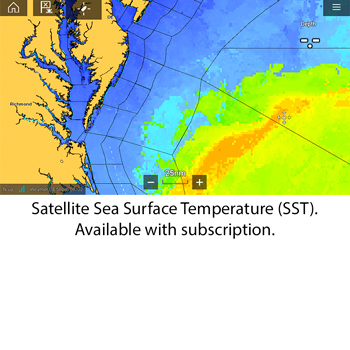 Also receive important information used by fisherman including high-resolution coastal and offshore sea surface temperature overlays. Please visit www.siriusxm.com/marine for full details on features, packages, pricing and for the most up-to-date satellite coverage map. 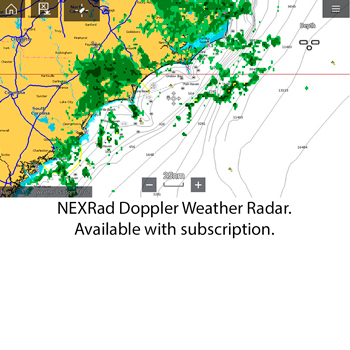 NEXRAD Doppler Weather Radar, Sea Surface Temps, Storm Tracking and More!